There is no question that I love meat. By no means am I a vegetarian. But these Veggie Tacos are SO good that I seriously did not even notice or care that my taco was meat free. Loaded with healthy vegetables and perfectly spiced, each vegetarian taco is topped with fresh cilantro and Queso Fresco cheese crumbles. They taste so light and fresh, and are incredibly flavorful…I could eat them all day long! I paired a serving with some low calorie red pepper soup, and felt quite full. I made a big batch, and reheated the next day for lunch and they were just as fantastic. These Veggie Tacos are perfect for feeding just the family or a large crowd, and are sure to be a hit. My husband and I LOVED them, and I definitely plan on adding them into my regular rotation of Weight Watchers Recipes. 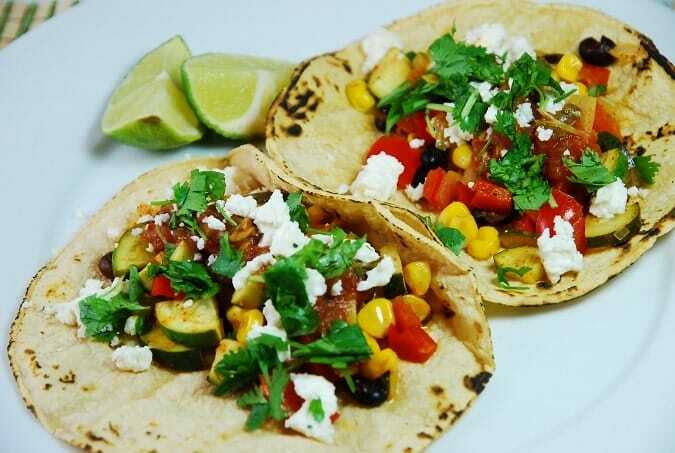 Fresh and flavorful, these vegetarian tacos make the perfect Weight Watchers lunch recipe. Even though they are meat free, they are still full of protein and are very satisfying. They are so delicious that even non-vegetarians will adore them! Spray a large skillet with nonfat cooking spray and set over medium high heat. Add in onion, garlic, ad bell pepper, and sauté for about 8-10 minutes. Add in zucchini, corn and black beans, cumin, chili powder, lime juice, salt and pepper. Stir and sauté until zucchini are tender. Warm tortillas over a gas burner or on a skillet. Divide vegetables among 8 tortillas. Top each with salsa, cilantro and the queso fresco. Serve immediately.